Chronic inflammation is a condition when your immune system starts attacking your body rather than healing it. In normal circumstances, when your body is injured, your immune cells travel to the affected area and summon cytokines that create pain thereby signalling to the body that there’s a problem. As a result, the blood flow increases and white blood cells surround the area to heal the injury. It’s the case of acute inflammation and is needed for one’s well-being. Acute inflammation helps you heal while chronic inflammation leads to various illnesses such as heart diseases, arthritis, irritable bowel diseases, and Psoriasis. 1. Whole grains such as barley, brown rice, and oats reduce the glycaemic load and suppress inflammation. 2. Include food rich in beta-carotene such as spinach, pumpkin, mangoes, and papaya. 3. 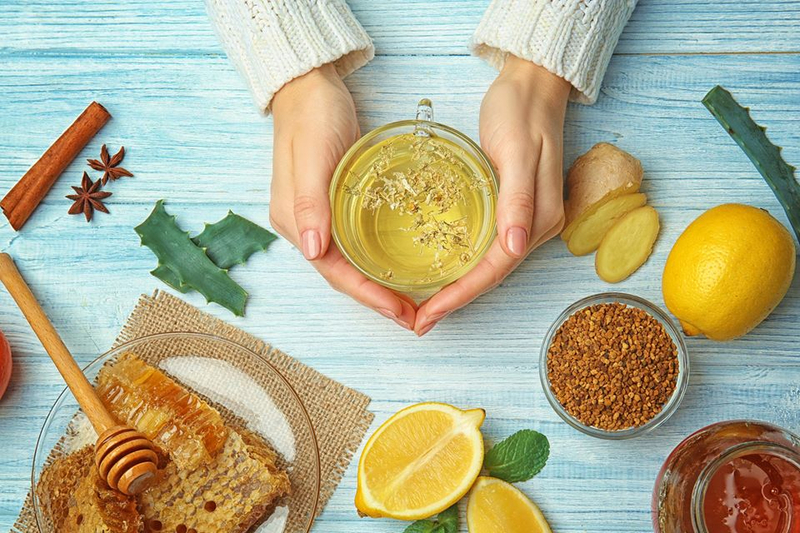 Green tea is rich in antioxidants and flavonoids (plant chemical found in citrus fruits) which improve body’s immunity and fight inflammation. 4. Include food rich in Vitamin C such as kiwis, blueberries, carrots, tomatoes, capsicum, and oranges, to support the immune system. 5. Gingerol, the key compound found in Ginger, has excellent anti-inflammation properties. Ginger tea, one of the oldest medicinal drinks, keeps your immunity strong. 6. According to a study published in the journal Brain, Behavior and Immunity, even 20 minutes on a treadmill at a brisk pace can reduce inflammation. 7. Stress can spike up inflammation levels. Whereas, positive emotions have anti-inflammatory effects. In a study published in the Journal Emotion, it was found that people who reported the widest range of positive emotions reported the lowest levels of inflammation. 8. Omega-3 fats suppress inflammation. Salmon, fish oil and flax oil can help you fight inflammation. 9. Adding Cinnamon to your diet can help you control Glucose levels and control inflammation. Cinnamaldehyde (a compound found in cinnamon) is an antioxidant that suppresses inflammatory compounds. 10. Adding garlic to your diet can have anti-inflammatory effects. If you are suffering from inflammatory joint diseases, then we suggest you check our Orthoherb tablets and oil. These Ayurvedic products offer relief from joint pain, cervical & lumbar Spondylosis, Sciatica, and all types of inflammatory joint conditions.